Our customers wanted an easier way to get more data to their labels without workflow modifications and then print directly from Microsoft Dynamics. Meet Print Suite Bridge, our enterprise labeling solution. Not only does Print Suite Bridge automate basic label printing, but it is the perfect solution to fill the gaps when it comes to labeling in AX 2012 or D365. First, you start by designing the label. Print Suite Bridge responds to the label requests using executables. These can be drop files or tables from AX / D365 or RF-SMART. Industry-standard labeling elements at your fingertips. 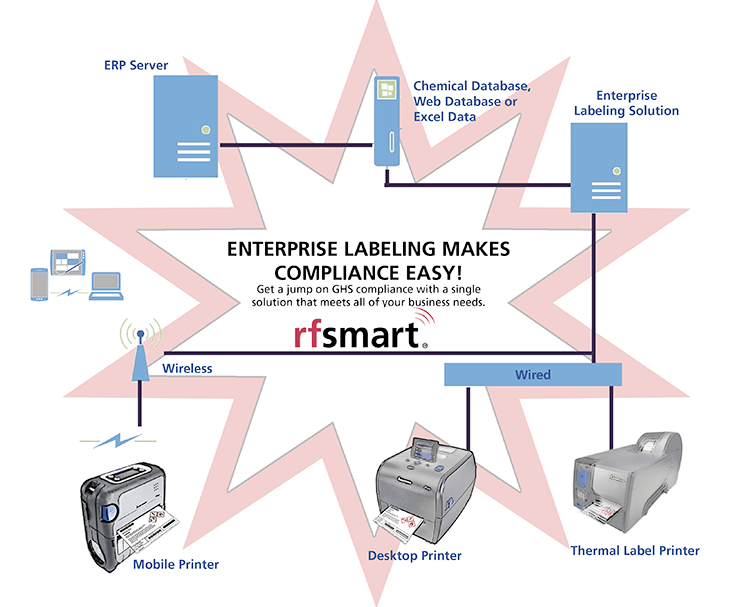 Pull symbols, signal words, and hazard elements from a centralized database, as well as additional label requirements (like lot and serial numbers, or expiration dates) from AX - ensuring that your compliance labels contain essential, approved messages to increase efficiency. Flexible and scalable. Connect all of your printers to your applications. Print Suite Bridge even connects to specific printers based on user, transaction, location or other AX field. With Print Suite Bridge, you can work from a single source of truth for creating and printing your labels - bringing all of your databases together in one place.